By the age of 13, Tommy was experiencing homelessness. He’d grown up with his mom and Godmother moving between Queens and Brooklyn, but by an early age, he was following the path of other negative influences surrounding him and found himself living on the streets as a teenager. He quickly figured he needed to do what it took to survive, and at the time for Tommy, that meant selling crack. Selling drugs, at first, seemed to be the best thing that had happened to Tommy yet. He was able to buy food, clothes, and anything he needed. Eventually, by the age of 16, Tommy was managing his own spot. While this brought a whole new level of comfort financially, it also brought along an immense amount of anxiety and stress. He was always looking over his shoulder and one day, his worst fear came true as he was shot by a rival drug dealer. While Tommy had been in and out of Juvenile Detention for selling drugs, it wasn’t until he was shot that he was found himself in prison for the long haul. He was rushed to the hospital to take care of his wound, but after treatment, this false sense of security that selling drugs had been for him began to crumble, and Tommy began serving his time, 26 years in prison. Tommy was also busy with other volunteering and work, including one of his favorite roles, leading Aggression Replacement Training. “I never thought I was a leadership person or a public speaker, but a friend pushed me to apply for this position and I realized I was great at it!” With all these wonderful things going on, Tommy unfortunately let his personal training certification expire and while he did love his work as an Aggression Replacement Trainer, he still felt pulled back towards fitness. Tommy realized he could combine his passion with his newfound talent for working with others and being a leader and began to make goals to earn back his certificate and take the fitness world by storm when he left prison. Looking back on his time in prison, Tommy recalls not just the goals he had for his career after he was out, but also the things he was excited to do. “While I was in prison, all I wanted to do was to run trails, run with a dog, and have a team to run with.” As Tommy was preparing for his transition back to New York City, he wasn’t sure how long it would take him to reach these career and personal goals, but he knew he would do what it would take to make it happen. As Tommy became more comfortable with his team, he realized there is so much more to Back on My Feet than the running. “Having access to the Back on My Feet office is a game changer. The employment support and staff resources have made every step more possible. Through networking with alumni, I’ve been connected with a few different employment options. 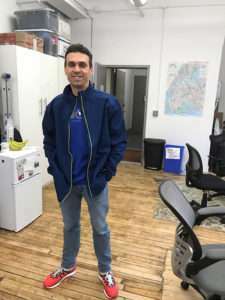 They are jobs I’m actually passionate about!” Tommy recently used the resources in the BoMF office to recertify himself in personal training and can often be found still in the office working hard on his resume and developing technology skills. Tommy considers Back on My Feet an essential guide on his path to employment and is always excited to celebrate his success with his Back on My Feet teammates, friends and supporters who have shown Tommy a true friendship that he will always cherish. Support our mission as we help more people like Tommy!